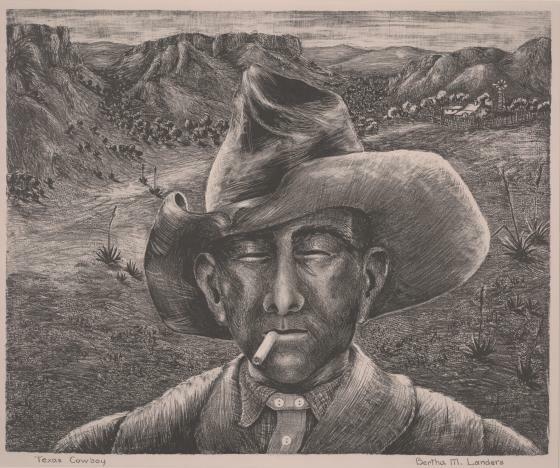 Bertha Landers deftly creates a graphic portrait of one of the iconic images of the Lone Star State, the Texas cowboy, here squinting his eyes against the harsh sun while smoking a handrolled cigarette. 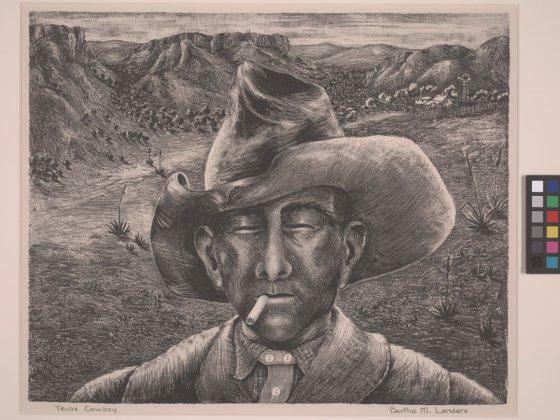 A skilled printmaker as well as a painter, Landers was born in Winnsboro and studied at Sul Ross State University in the Trans-Pecos region of Texas, the Colorado Springs Fine Arts Center, and the Art Students League in New York. She was a founding member of Texas Printmakers. William Keyse Rudolph, DMA label copy, 2008. Bertha Landers founded the audiovisual department at the Dallas Public Library in 1942.